The last group of Russians and citizens of former Soviet republics has been evacuated from conflict-torn Libya. According to some witnesses to the events in the country, the situation is not exactly as bad as it appears in media reports. On Wednesday, an Emergencies Ministry Il-62 plane touched down in Moscow bringing 126 Russians and 21 citizens of the Commonwealth of Independent States (CIS) from Malta, where they had been taken from the North African country by ship. 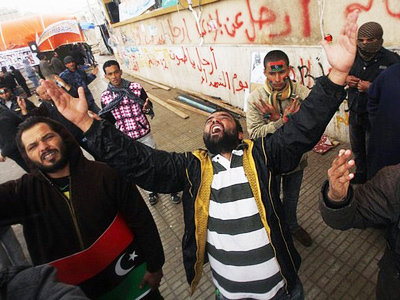 All in all, 510, including 341 Russians, were evacuated from Libya to Russia since the beginning of the unrest. Conflicting reports have been coming from the North African country on what is actually going on there. Now, eyewitnesses – mainly employees of the Russian Railways who worked in Libya – have spoken out on what they had to undergo in recent weeks. “The locals and the army were protecting us from raiders,” a Russian man who worked in Benghazi, Libya’s second largest city, told reporters at Moscow’s Domodedovo airport. Responding to a question on whether there were any clashes in the area, he said he saw nothing of the sort, “Our place was the quietest”. According to another eyewitness, there were bread shortages for a couple of days, but “when the Libyans learned about that, cars with bread were immediately sent to us”. The man added that cooperation and mutual understanding with the locals was “ideal”. Mansurbek Sultanov, an Uzbek citizen, told Channel One that there were four Serbian nationals with bullet wounds on the ship that ferried people from Libya to Malta. Anton Novozhilov recalled there was no real threat, but the atmosphere was pretty tense since it was unclear what was really happening. “But we were provided with food and water. In general, everything was calm,” he added. 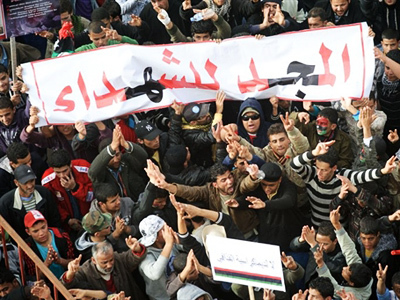 Unrest in Libya is also one of the hottest topics buzzing around on the Internet, and some bloggers suggest that media has been exaggerating the scale of violence in the country. A website of an organization called “St Petersburg’s Centre for Modern Middle East Research”, meast.ru, has gone as far as claiming that “an information war” was launched against the North African state. 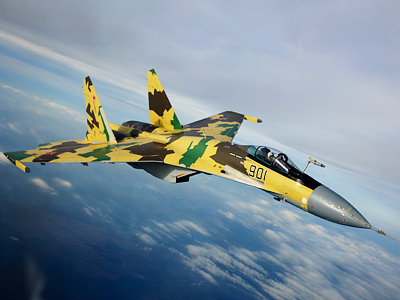 According to an article signed by the website’s Editor in Chief, Gumer Isaev, information on warplanes loyal to Colonel Gaddafi bombing demonstrators was not exactly true. 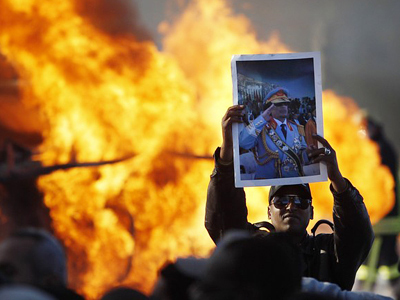 The author says that in the first days of the Libyan uprising, he contacted a friend who was working in the country via Skype – the internet telephony service. For one thing, the internet was actually working. And then, he claims, citing his friend, there were no bombings of Tripoli. “Someone heard plane engines rumbling. The aircraft did hit ammunition depots on the outskirts to prevent them from being completely looted. There were planes, there were bombs, and there were demonstrators somewhere.But the media reported that aircraft had bombed residential areas and protesters,” the text reads. Kirill Tereenkov, an author of an article published by clubvi.ru website and reposted by quite a few bloggers accuses the media of lying and placed part of the blame on foreign interference for triggering the protests in Libya. 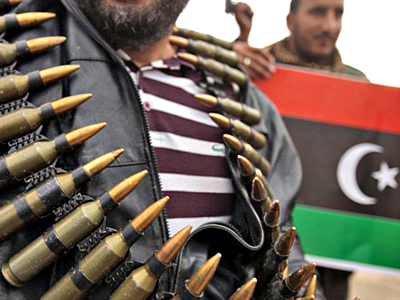 The man states that he witnessed events in the capital Tripoli and in West Libya. By February 27, he said, the situation stabilized and the “split line” between the conflicting sides was going across the eastern town of Ajdabiya. “There have been no rebels to the west of Ras Lanuf except for occasional inter-tribal clashes. The entire West, South-West and Center of the country are under Tripoli’s control and continue their daily lives as if nothing has happened. 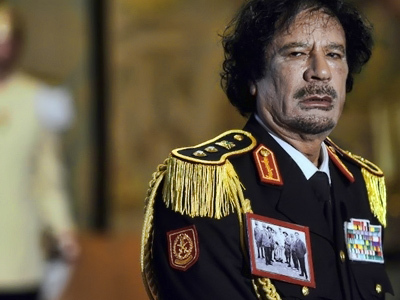 The largest Libyan tribe – Warfalla – confirmed its loyalty to Muammar Gaddafi….The army as such has not been taking part in the events so far,” Tereenkov stated. Blogger Nikolay Starikov put up a post on his LiveJounral page where he collected eyewitness accounts of the events. Or at least what people stated that they had seen. A Ukrainian woman nicknamed “the Libyan” living 70 kilometers west of Tripoli wrote on February 26 that only one night the situation was uneasy in her town. “Yes, they set fire to police stations but now are re-painting them together,” she said.In another town, 80 kilometers west of the capital a court building “where cases on drug trade were kept” was burned down. The following day the arsonists were discovered. They were minors, mainly boys who were on drugs or brothers of those whose cases were at the court, the woman wrote. She added that she was not going to leave the country and saw no sense in doing so. 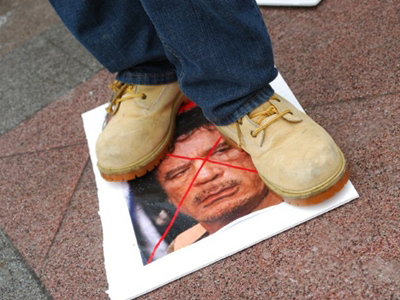 The Russian tabloid newspaper Komsomolskaya Pravda published an article entitled “The Western media lies about Libyan riots just like it did about the Georgian war in 2008.” The author wonders why no evidence – not even a single photo or mobile phone video – showing mass casualties and bombings has been presented so far. 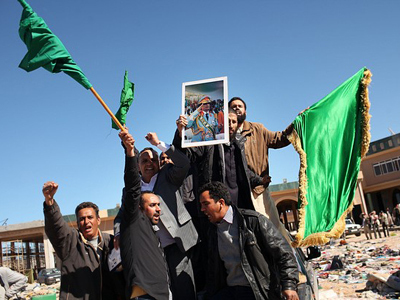 “Neither Gaddafi’s planes, nor his helicopters have appeared on photographs – as if a magic spell was cast on them,” the article reads. Meanwhile, oil prices have reached highs not seen since 2008 as the market reacted to the events in the resource-rich North African state. 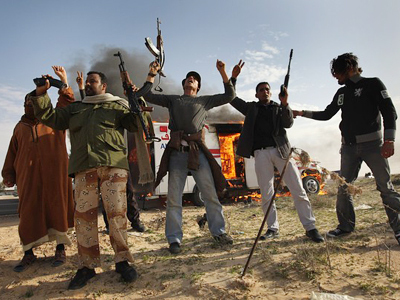 Moreover, the US and NATO are moving planes and warships closer to Libya preparing for a humanitarian mission.